After an initial deluge of stories, over the last three years, about the quirky-but-likeable President of the United States, Donald Trump, things seem to have settled down at last, and the media is now resorting to different tactics including inventing stories that are more ridiculous every day. Mr Trump is keeping his head down, however, and getting on with business. Whilst he is, reporters everywhere are delving deeper and deeper to grab their readers' attentions. "Trump has never listened to a Kraftwerk album!" 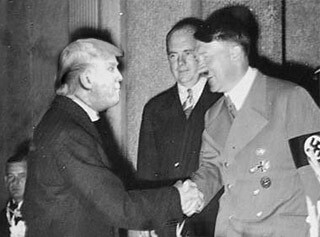 "Trump at Berchtesgaden to see Führer!" "Donald Trump threatens to put an end to bullfighting!" "Trump close to shutting down Cosa Nostra!" "Brexit decision delayed until 2030!" In the US, there was much speculation in the media as to how the words 'collusion' and 'redacted' had seamlessly passed into the language of ordinary folks, and become part of everyday speech. Meanwhile, behind the Iron Curtain, all was quiet.